In the small Spanish town of Cuenca, time appears to stand still, carved in stone atop a precipice 3,300 feet above a river gorge. That’s where you see the Casas Colgadas, or Hanging Houses, Cuenca’s most iconic image. The houses dominate the landscape above the Huecar River gorge and date to at least the 14th Century, some say to even earlier when Moors ruled this rocky land. Cuenca’s history is filled with Muslim, Christian and Jewish roots and leaves a mixed legacy that adds to the drama of the place. Moors ruled the land in the 8th Century. The medieval mingles with the modern here and does so quite well. For example, the hanging houses today are home to a restaurant and modern art museum. Many of the buildings in Cuenca are constructed on many levels with entrances at street level and interior floors further down the cliff sides. About 100 miles from Madrid in central Spain, Cuenca is in the province of Castille-La Mancha, yes, that La Mancha, the one of Don Quixote fame. In fact, you could do a complete tour of sites mentioned in the Miguel de Cervantes book by following any of many Don Quixote routes outlined by the Spanish government, covering more than 600 miles in the La Mancha region. In Cuenca, the ancient is always present, but modern art is a key attraction for tourists in this city of 50,000. At least three museums focus on modern art, including The Museo de Arte Abstracto Espanol, housed in the Casas Colgadas. 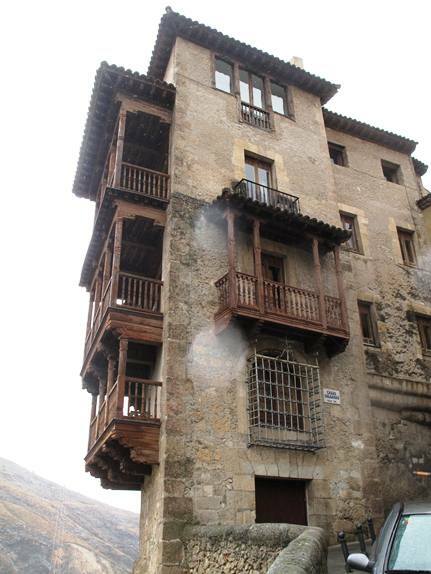 It opened in 1966 when artist Fernando Zobel brought his collection to Cuenca and it features works from the likes of Torner, Saura, Rueda, Chillida and Tapies can be found here. 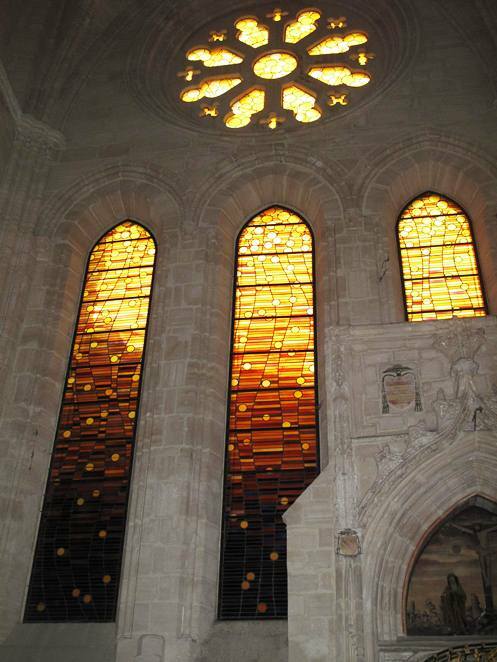 In the city’s remarkable Cathedral Santa Maria de Gracia, which was consecrated in 1208 and houses a Virgin Mary statue dating to the 12th Century, stained glass windows designed by Gustavo Torner were installed in 1993. The yellow, orange and white windows are a brilliant, abstract representation of DNA, the molecules of life, and seem perfectly at home in the historical setting.